Hello! 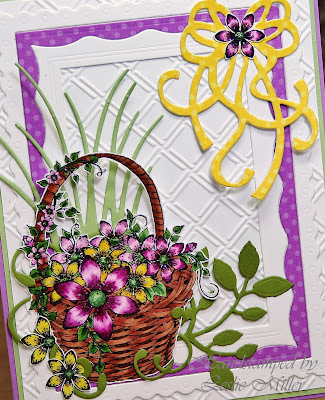 Today I'd like to share a card that was extra fun to create using pretty stamps from the Heartfelt Creations Sun Kissed Fleur Collection and several fabulous Dies R Us dies. After coloring the flower basket with Copic markers I cut it out and set about arranging the parts I had chosen for my design. I layered a base of orchid and green, then covered that with a panel of Cuttlebug Wicker Weave embossed white. Now, for the really fun part. . . Impression Obsession Rectangle 6-in-1 Frames -- This die cuts six frames all at once. You can use one frame individually or piece a few together, as I did here. I cut two frame sets, one from white and one from purple polka dots, and sandwiched the purple in the middle. So many cute possibilities with this die set! 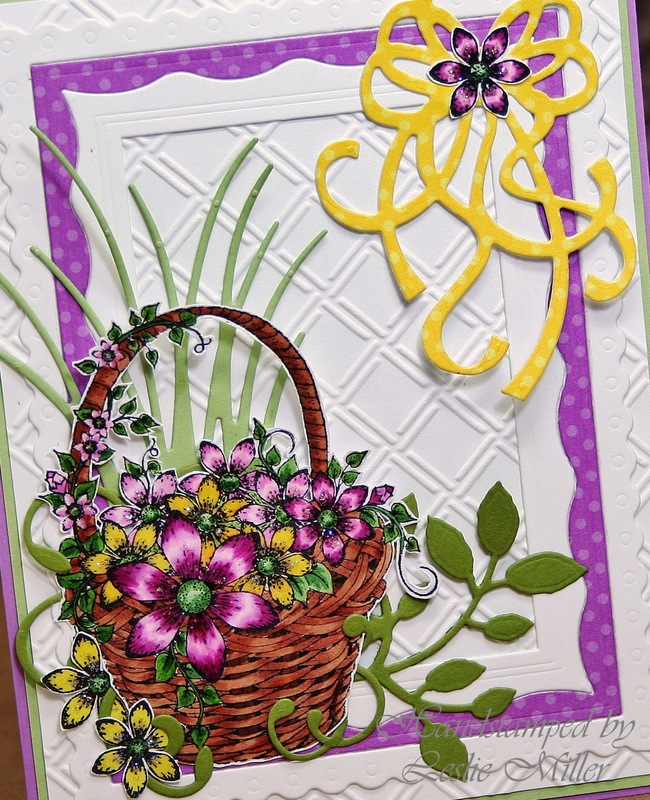 Spellbinders Sprigs and Impression Obsession Grass – I taped these die cuts to the back of the flower basket before adhering the basket to the card. Die-namites Beautiful Bow – Pretty and playful, it seems a fitting accent for the whimsical nature of the frame. I added a little glitter to the flowers, too. With all these pretty parts I didn’t pop up a single thing or use any hardware on the card, yet it’s loaded with texture and dimension. I do love a card that fits easily in an envelope! Thanks for joining me today! 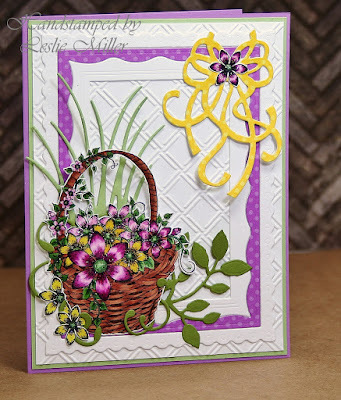 Gorgeous coloring & now I have more dies for my wish list!